After so many years, looking for my perfect face products, I think I finally find them. And that means it's finally time, for me to show you what I am using in my morning routine. Since I am using different products in the morning and evening I will first show you my morning routine, then my evening. And for the end I will show special treatments like masks and peelings I enjoy using it. A word or two about my skin type first. Ever since I can remember my skin was really thin and dry. 6 years ago, when I finished high school, my skin become sensitive too. Imagine doing peelings to really thin skin almost every week. Yea me neither! But my professor always forced my college into doing peeling while facial class, even if I begged not to. (if I had all that knowlege about skin care as I have now, I would sent my professor somewhere, where sun never shines!!!!) And 3 years ago, when I stop eating birth control peels my breakouts starts. Thank you for that my dear hormones! It is a win win, not. Sensitive dry skin with hormonal breakouts. in 6 words. A few people that knows I am a beautician, asks me if it is important to properly cleanse their face in the morning. You know when you woke up in the morning and your skin looks really nice and glowy? Well that is sweat and the sebum that our skin provides in the night time. So yes cleansing your face in the morning is just as important as in evening. I wash my face with lukewarm water and then I rotate between two cleansers. Himalaya Purifying Neem Face Wash which is one of my favourite. You can see I just emptied a big size and before that 3 mini sized tubes. This one cleanse my skin really gently but at the same time really good. It helped me with all my hormonal break outs. The next one I owned a few years back, but I just couldn't remember why I didn't like it back there. So after a lot of bloggers talked how they like it, I repurchase it. And this time I actually like it. 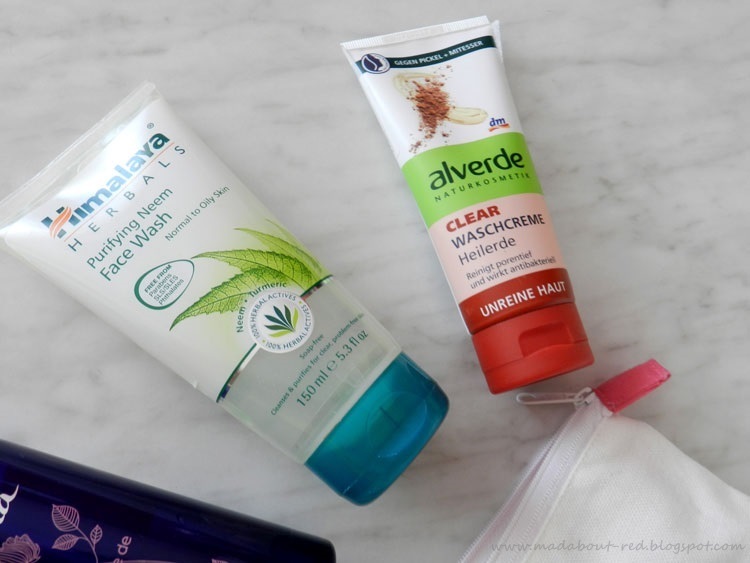 Alverde Clear Waschcreme is one of those non-foaming creams, with strange smell and colour, but it does the job. Perfect for sensitive skin with impurities. I always take a few minutes and gently massage my cleanser around my face with circular motions. Then I simply wash it of with lukewarm water. It makes quite a difference on your skin, if you take a minute or two and gently massage cleanser around your face. And I never avoid the eye area. 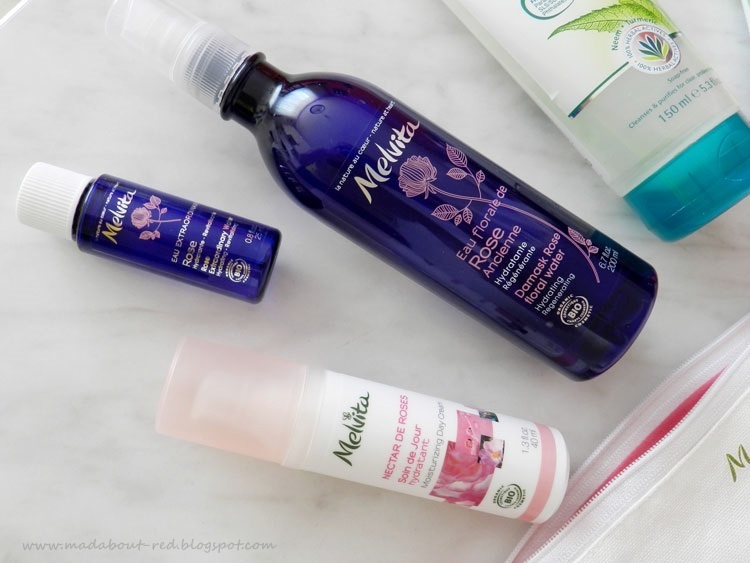 After I blot dry my skin I love to spray my beloved Melvita Damask Rose Floral Water. It wakens me and I somehow love the smell of it. While waiting to absorbs into my skin I like to tap it with my fingertips gently pushing into the skin. (I have no idea how to explain this). 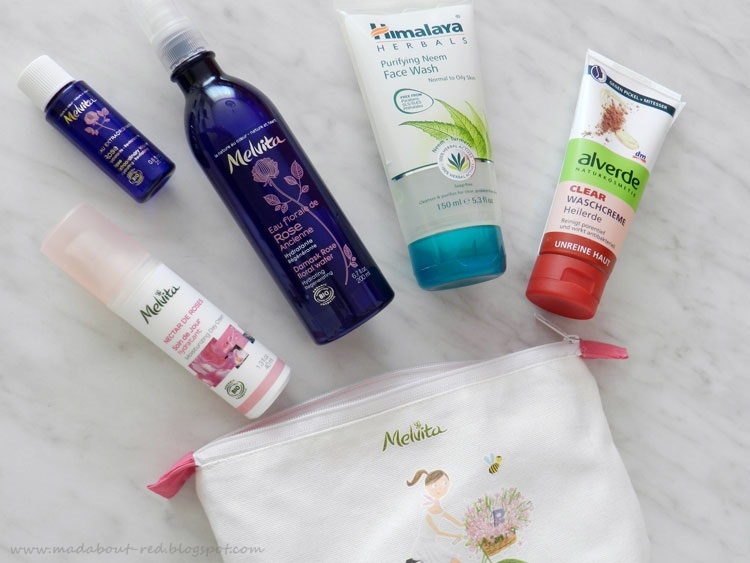 Next is Melvita Rose extraordinary Water which already nicely moisturise my super dry skin and making it comfortable. I tap it again into my skin. I somehow prefer taping instead of massaging whit more liquid products. Last but not least is Melvita Moisturising Day Cream, one of my all time favourite day creams. Light but at the same time super moisturising. Nothing greasy. Leaving my skin super soft and hydrated. I like the smell here too. I firstly massage it with circular motions, but I like to tap it into the skin for the end. It is perfect for under the make up too. Working amazing with my heavy Revlon Colorstay. I would love too hear what do you use in your morning routine. I am always on a hunt after good face products, So let me know in the comments what do you use. Tudi cvetne vodice so mi super :) ! Enkrat sem imela tester Huimalayinga cleanserja (ne vem, če točno tega) in mi je grozno izsušil kožo. Ojoj res? Meni je tale na sreco ne. Jaz uporabljam namesto tonika. Itak imajo isto vlogo kot tonik. Ampak te klasicne, intenzivne so ze za vlazenje. Alverde čistilni gel jaz tudi uporabljam. Res je odličen za občutljivo kožo:). Če imaš občutljivo kožo so meni všeč Afroditine kreme iz linije Kamilica za občutljivo kožo, Avonove Nutra Effects Hydration in pa La Roche-Posay Hydreane Riche. S čim pa si odstranjuješ makeup zvečer? Jaz uporabljam še vedno Baleino Med mleko. Je tudi bolj za občutljivo kožo in mi je všeč, da lahko dobro vmasiram v kožo in makeup. Aem imela Hydraene Lagere in je bila super :) Ampak sem se odlocla it na cim bolj naravno oz. Organsko kozmetiko. S cim manj kemije ;) Vseeno hvala za nasvete, se strinjam s tabo, da so vse super za obcutljivo kozo. Mislim, da ti ne bo zal.